The world of quantum physics is generally thought of as hopelessly esoteric. While classical physics gives us the laws governing why a ball rolls downhill, how a plane is able to fly, and so on, its quantum cousin gives us particles that are actually waves, "spooky" action at a distance, and Schrodinger's unlucky cat. But, believe it or not, even the most mundane of everyday activities is profoundly influenced by the abstract and exotic world of the quantum. 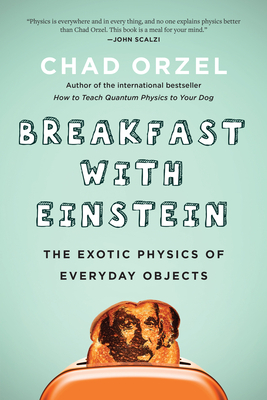 In Breakfast with Einstein, Chad Orzel illuminates the strange phenomena lurking just beneath the surface of our ordinary lives by digging into the surprisingly complicated physics involved in his (and anyone's) morning routine. Orzel, author of How to Teach Quantum Physics to Your Dog, explores how quantum connects with everyday reality, and offers engaging, layperson-level explanations of the mind-bending ideas central to modern physics. From the sun, alarm clocks, and the red glow of a toaster's hot filaments (the glow that launched quantum mechanics) to the chemistry of food aroma, a typical day is rich with examples of quantum weirdness. Breakfast with Einstein reveals the hidden physics all around us, and after reading this book, your ordinary mornings will never seem quite as ordinary again. Chad Orzel is a physicist, professor, and blogger, and the author of three previous books How to Teach Quantum Physics to Your Dog, How to Teach Relativity to Your Dog, and Eureka: Discovering Your Inner Scientist. He is an Associate Professor in the Department of Physics and Astronomy at Union College in Schenectady, NY, where he has been on the faculty since 2001. Orzel has been blogging about physics and academia for Forbes and Scienceblogs.com since 2002. He is earned a BA in physics from Williams College and a PhD in chemical physics from the University of Maryland, College Park. At that time, he completed his thesis research at the National Institute of Standards and Technology with Bill Phillips (Nobel Laureate in 1997), and he was a post-doc at Yale before starting at Union, studying the quantum physics of ultra-cold atoms.